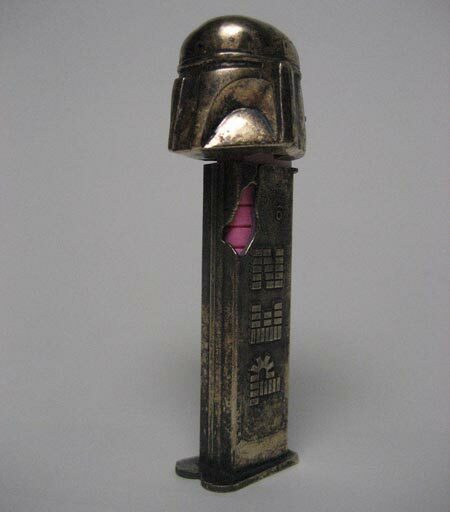 Check out this amazing hand made PEZ dispensermade by Star Wars enthusiast Scott. I made this using the lost wax casting process with an organic burnout. The material is silicon bronze. The original sleeve for the Pez broke, so I cannibalize dparts from another dispenser: Simba from the Lion King. The hole in the body resulted from an incomplete casting of the thin part; probably could have had better sprue placement. I like the results, though. The replacement sleeve was modified for the “battle scar” effect, revealing the Pez. Finishing was minimal, with a pretty standard bronze patina.